Samson was so proud of his victory over the Lion that he made a riddle to summarise the event and asked the 30 relatives of his bride to try and solve it, in exchange for some suave garments. The men were unable to solve the riddle and so they resorted to threatening Samson’s bride to discover the answer. Samson’s bride played the ‘if you really love me, confide in me’ card, and he fell for it. Samson didn’t fully analyse the situation, he lacked discernment and was driven by the emotions of another. What can we learn from this episode? Check where peoples’ loyalties are before you reveal intimate things to them. Samson wrongly assumed that his bride was a ‘ride or die’. In her mind, she was still under the authority and influence of her kinsmen, her allegiance was to her family. Have you ever been open to someone about a personal issue and they go and use it for CNN’s breaking news? We need to discern peoples’ characters and loyalty before pouring out the intimate things about ourselves, lest they use it to harm you. It’s all part of guarding your heart where the issues of life come from, so that your issues don’t reach Sky News. The second thing we can learn is that the influence of a woman can be dangerous or lifesaving. When a woman is not under the influence of God, her influence can become a threat. 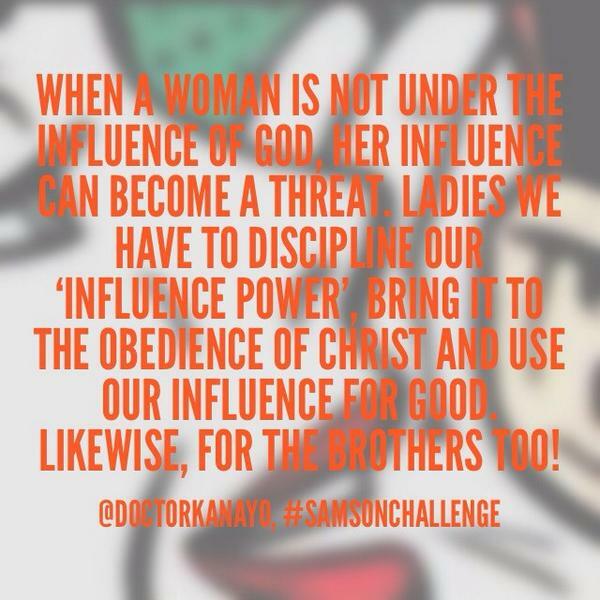 Ladies we have to discipline our ‘influence power’, bring it to the obedience of Christ and use our influence for good. Likewise, for the brothers too! When we look at the story of Abigail and her husband Nabal, Abigail was instrumental in saving her husband’s life, by appeasing King David after her husband insulted Him. This is good influence. In contrast, Sarah used her emotions to influence Abraham to have a child with her maid, this influence birthed a whole new religion. Of course it’s one thing to be influenced, but it’s another thing to act upon it. This is why we all need the Spirit of discernment; to know what is a directive of God and what isn’t. The last verse in this chapter must have been a big ego blow to Samson. His bride was given to His Best Man! Sounds like something from a soap opera. Poor Samson!